Compare prices on car hire in Saint Quentin from all the major brands and find the best deals. When you book through us, unlimited mileage and insurance are always included in the price given. Saint-Quentin is a town in the northeastern part of France in Picardie, 155 kilometers northeast of Paris . 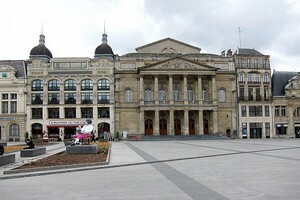 Saint-Quentin is located on the River Somme and the Canal de Saint-Quentin. Approx. 59,000 inhabitants belong to Saint-Quentin. Saint-Quentin was established by the Romans, and then called Augusta Viromanduorum. In the Middle Ages, Saint-Quentin capital of the county of Vermandois. At this time, a monastery founded in the city here. The city has a textile industry that dates back to the 1500s. The city has several older buildings as the cathedral from 1200-1400’s, famous for its sculptures and stained glass. Here is a museum with art from the 1700s and a city hall from the 1400s. The city’s Champs-Elysées park offers good opportunities for the promenade, and it is also good hiking along the Saint-Quentin Canal. Saint-Quentin also has a basilica and a palace, palais de Fervaques, in addition to some museums. Paris Roissy-Charles de Gaulle is the nearest airport 145 km from Saint-Quentin center.